Book hotel rooms online with us at Dom Pedro Marina Hotel at the lowest rate, guaranteed. 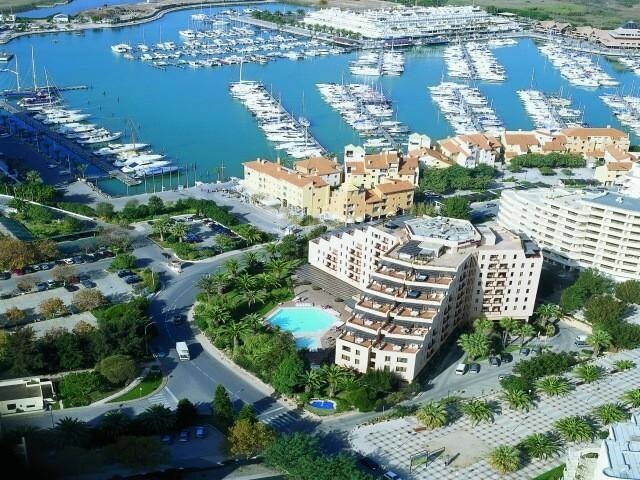 Get a holiday discount room rate at the 4 Star Hotel Dom Pedro Marina in Vilamoura in the Algarve that enjoys a reputation noted for its service and practicality. The hotel has 155 bedrooms designed to provide comfort to either two or four persons and there are 34 suites including 4 Presidential Suites with a private Jacuzzi and a generous terrace. All rooms are air-conditioned with satellite TV, there is a pool with sun loungers and underground parking for guests. Hotel Dom Pedro in the Algarve is only five minutes walk to the Marina with its many restaurants, bars and shops, or alternatively the Vilamoura Casino. A good location for golfers being only a few minutes drive from several championship golf courses. Wi-Fi is available.